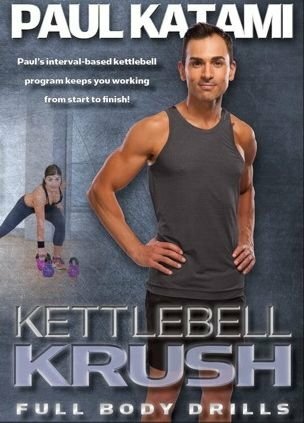 Kettlebell Krush is a new workout by the kettlebell master Paul Katami. It is a tough and effective metabolic strength training workout. And only 40 minutes! He packs a lot into 40 minutes! I really enjoyed both of Paul’s new workouts; this one and H.I.5. Both are short but intense and so varied that they are also lots of fun. I had forgotten what a great presence Paul has on screen. I really need to pull out some of his older workouts in my collection. From memory, the other two workouts I own by Paul, A.S.A.P Hollywood Bootcamp 4×4 and Burn & Build, were much more intense and advanced than these two new ones. But that could also be because they were both almost twice as long. If I had been doing Kettlebell Krush or H.I.5 for 70+ minutes, I might find them just as intense and advanced as the other workouts! In addition to the workout, Kettlebell Krush has a 3 minute “clinic” in which he goes over form for two exercises included in the workout: kettlebell swings and clean & rack. Paul has two female crew members; one doing advanced versions of the exercises and one modifier. They all have 3 kettlebells in front of them, but I only observed them using two of the bells. I brought out my 20 pound kettlebell, my 15 pound kettlebell and my 10 pound kettlebell, but like Paul and crew I only ended up using my 20 and my 15 pound kettlebells. Once this workout starts, it moves fast and never really slows down until the end, tho there are a few recovery type moves (like halos after swings). The moves continue to get more challenging as the workout progresses. The little 10 second recovery doesn’t seem like much! Kettlebell Krush is 40 minutes long with a 4 minute warm up, 33 training time and 3 minute stretch. The warm up starts sans kettlebell, but then you grab the lighter one near the end of the warm up. The warm up includes basic squats, deadlift, a balance move (knee up and extend same leg back with hand reaching to floor), do this balance move again but add a row with the lighter kettlebell. Grab your heavy kettlebell. Each number below represents one 30 second interval. Remember, you get a 10 second recovery between each 30 second interval. Better than his “Kettlebell Drills”- Better meaning harder…..